The aptly named Mammoth Wasp is an intimidating – looking insect, but despite its black and yellow ‘warning’ colours, it is not at all dangerous to people. They are large impressive insects and females may grow to reach 4.5cm in length; the males are a little smaller and differ slightly in their appearance. 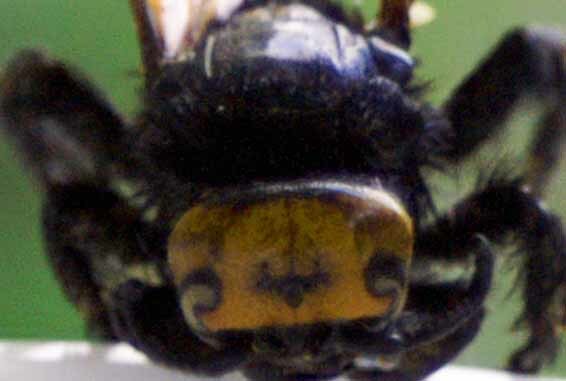 Females have a yellow face and short antennae, while the smaller males have a black face and longer antennae.Both are marked with yellow bands on their abdomens, which may be broken and show as four yellow spots. The wasps are most likely to be noticed in the warmer weather of late May, June, July and August when they are found around flowers, seeking nectar. Mammoth Wasps are solitary and unlikely to be seen in any numbers. They are a parasitic species and females may be seen around decaying wood, tree stumps and the like, seeking the larvae of a specific beetle to parasitise.She will be searching for a large, plump larva of the Rhinosceros beetle (Oryctytes nasicornis); when she finds one, she will sting it to paralyse it, then lay an egg on its outer skin. Once the wasp larva hatches it will eat into its unfortunate and helpless host, thus killing it. The larva then builds itself a cocoon close to the host’s remains and remains there until the spring when the weather is warm enough for it to emerge as an adult. 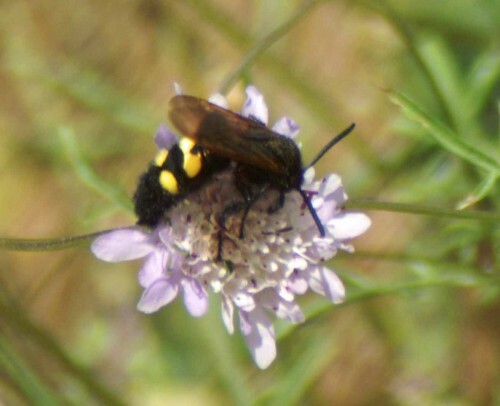 There are several species of Mammoth Wasp in Iberia, another of which is Megascolia bidens. The most marked difference from the species described above is in the antennae, which are always coloured, either yellow as the specimen in my photographs or sometimes a reddish-orange colour. 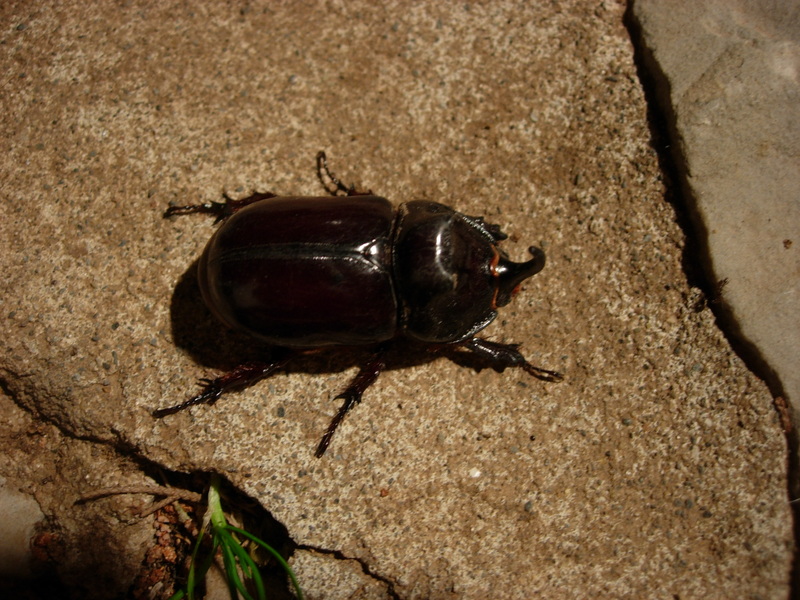 I’ve just found a girl-beast one of these in Northern Spain. Glad to hear it’s not dangerous as it certainly looked it. I’ll have to take some photographs. Lucky you – I’ve only seen 1 so far this year, another male. Females must be all out hunting for hapless rhino beetle larvae victims. I’ll keep a look-out for your pics and keep trying for better ones myself! I think you must have them all up there further north – I’ve still only managed to see two here, so look after them! we live in Bulgaria and we think this is what is all over our mock orange bush. I have seen them alone but never so many together. I do not feel threatened by them and they don’t worry about me being there watching them. the ones in the garden differ a little because there is no orange/yellow head just black and one HUGE one that had a RED head. Is there a closely related species to these or will they differ from country to country? We have seen one last Sunday (Melieha, Malta) and another this week (Selmun’s Palace, Malta) – both female. Very impressive. For some strange reason, I seem to have a couple of swarms of these, or of something very similar. I have the decaying stumps of 3 alianthis altissimus trees (tree of heaven), and the wasps hang round these in numbers – sometimes up to a dozen or more can be seen at once. I find I can approach them with little sense of threat from them, although trying to get a picture of them is not easy, as their flight is rapid and erratic – I did manage to photograph one male on the ground which was behaving oddly, and also with a second male, looking as though they were trying to mate!. I am in in the hills about 15 km in from the coast in Malaga province. I first noticed them last year while making a flying visit in July, but then left for work, and by the time I returned, they had vanished for the winter. They have only just reappeared. Can post you some pics for positive ID if you are interested. How do I post the pics? I don’t see any way of doing this direct on the page. I’ve attached some pics. Hopefully they’ll come through OK – sometimes have problems posting attachments. I notice the wasps seem to have disappeared so can’t help but wonder if there is a colony of beetles living in the dead tree stumps, and it is their larvae which attract the wasps. Out of curiosity. Something I have been noticing over the last few years, but especially this year it is very noticeable, is a massive reduction in insect numbers. 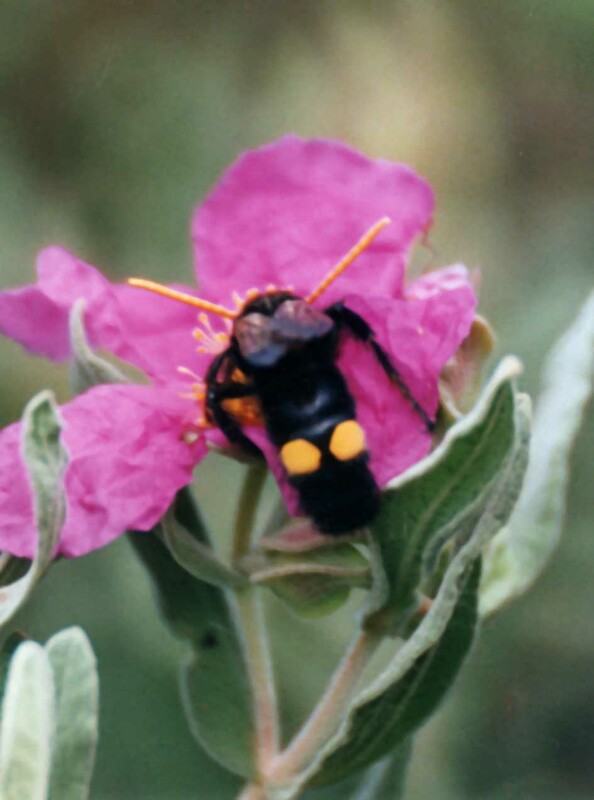 Carpenter bees, once ubiquitous – it used to be normal that there was always one or two buzzing and bumbling around – have all but vanished here. If I see them more than a couple of times in a week, I am surprised, and such is their rarity that I now do very much take note when I see them. 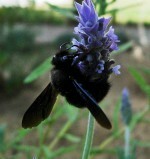 The same for bumble bees. Today I went for a wander round part of my land which is easily accesible. Since there is a lot of groundwater where I live, there is still a lot of greenery and wildflowers, especially, but not restricted to umbiflors, and this year, following the excessively wet spring, even more so than normal. Normally, I would expect to see these full of insects – beetles, butterflies, hoverflies, bees, wasps, etc., etc. But nothing. The only insect present seemed to be cicadas. And as I wandered round, I couldn’t help but think of the title of Rachel Caron’s famous book from 1962 – Silent Spring. Although my own land hasn’t been sprayed in the 13 years I’ve been here, I know the local campesinos do spray their land quite heavily – usual one here seems to be Attila, whoich is a glyphosate and is definitely not good. There is huge coverage of the decline of honeybees, but only recently am I starting to run across comments in articles regarding this, that wasp numbers are also collapsing. Anyway, what I was wondering is if you see this sort of trend down your way in Cadiz, as I am very concerned by it. I’ve been an active environmentalist since the ’70’s, including a couple fo years working on the boats with Greenpeace in the mid-80’s, but it is quite disturbing in th eleast to be seeing our predictions now being played out in front of me! But it’s a lovely summer – not too hot, not too humid, and in among the no insects, the good news is no mosquitoes either! And on that happy note. I just want to say thank you for the information provided here, as it was the first and best site concerning this wasp. I live along the Gulf coast in North Florida, and we have these as well, and all anyone here could tell me was to leave them alone, as they were dangerous. Good to know the facts, now. And Gavin, I too have been watching the butterflies, carpenter bees, orb weavers, golden silk spiders, dragonflies, and other insects come in less and less numbers over the years. Thus less lizards and frogs, etc. It concerns me and I find it sad that my grandson may never know the joy of watching these creatures do what they do in nature. However, I wish I could say the same of the mosquitoes. There are plenty of them with few creatures left to catch them. I do, however, provide habitat for all that live here, and there are no poisons sprayed or otherwise applied near me, only the toxic environmental overload that we are all facing. Thank you Christy, I’m happy you found the blog about the Mammoth wasps useful; they are impressive insects aren’t they. I only wish my photographs of them were better! I was hoping to get some more shots during my recent trip back to Spain, but didn’t see a single one. You live in a beautiful part of the world that I have visited a few times on family holidays and hope to get back to in the future, despite the mossies. Best wishes. Saw two of these beasties this morning amongst the blue morning glory flowers over my car port on Northern Costa Blanca. Didn’t know what they were until I found this website. Glad they’re not as dangerous as they look, I’ll now make a bit more effort in trying to get near enough to photograph. I’m glad you found out about the Mammoth Wasps, they’re great insects and where the wasps are there’ll be Rhinoceseros Beetles too. Good luck with the photos, the wasps are big but can be quick! Best wishes. Just saw one in my backyard in North Carolina. I threw out some water from my dogs bowl and one came up from the grass. It was huge. Freaked me out because my daughter and i are severely allergic to wasps. But strange everyone commenting on these have been from other countries. I can understand why you’d be surprised if one of these beauties suddenly appeared out of nowhere, they are certainly huge, as you say! I hope you haven’t had nightmares, your allergy must make you super-aware of all black and yellow insects. I think the chances of being stung by one are quite slight, provided you leave them alone, they are solitary wasps and don’t tend to seek out homes as potential sources of food as the smaller social wasps do.I have written about the European Mammoth Wasp, do the ones you get look exactly the same? A lady from Florida says they occur there too. Saw a few of these yesterday on the beach in Tarifa, couldn’t find them in my book , luckily I have used your site before and found it straight away. Do you think they might have migrated over from North Africa? Thanks for visiting the blog and I’m happy to hear you found the ID you were looking for. I have never seen a Mammoth wasp on a beach, so can’t guess what they were doing there unless they had found a source of nectar there? They are a species native to Southern Spain and not known to migrate, but as you were in Tarifa, there’s always the possibility they may have been blown there either from N Africa or from another part of the coast. Lucky you to have seen them! Further to my commentary above from 3 years ago on how insects seem to be becoming scarcer, this year has, as far as I’m concerned, been almost catastrophic. Apart from a brief window of a few weeks early last month, almost no bees at all this year. 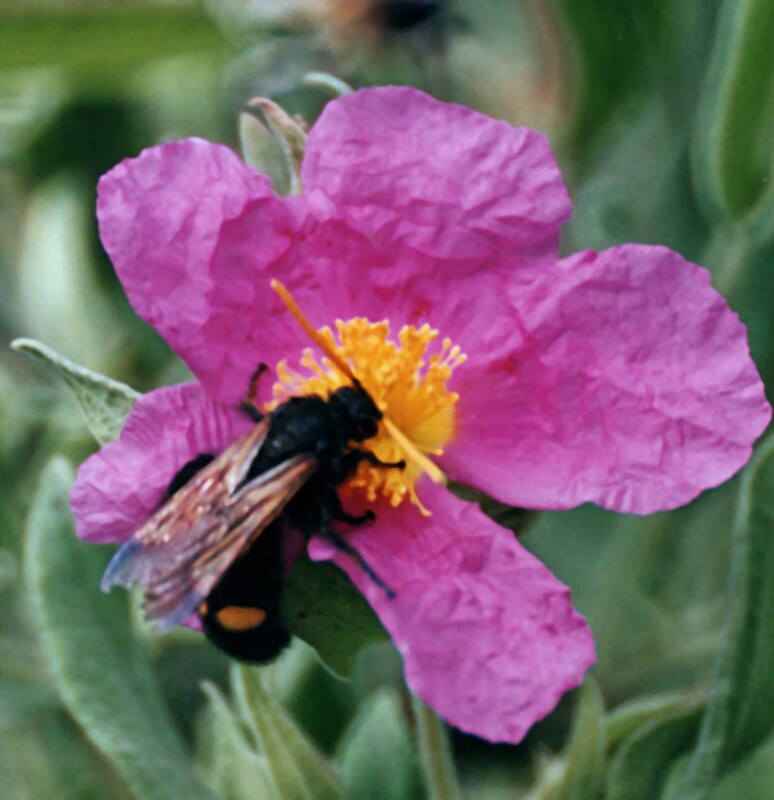 I think I could count the number of times I have seen carpenter bees on two hands, honey bees are almost invisible, I have not seen a single bumble bee, wasps are in serious short supply, I have seen one hornet, and sadly, the mammoth wasps have also vanished. 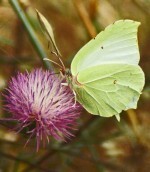 As well, butterflies are noticeable in their almost total absence. Also, so far, only a couple of mosquitoes – the only insects which appear to be on the increase are sandflies and ants. Sitting out at night, there are almost no insects round the lights, compared with how it used to be a few decades ago. In late spring, I have both lavender and lilac in flowering quantity. 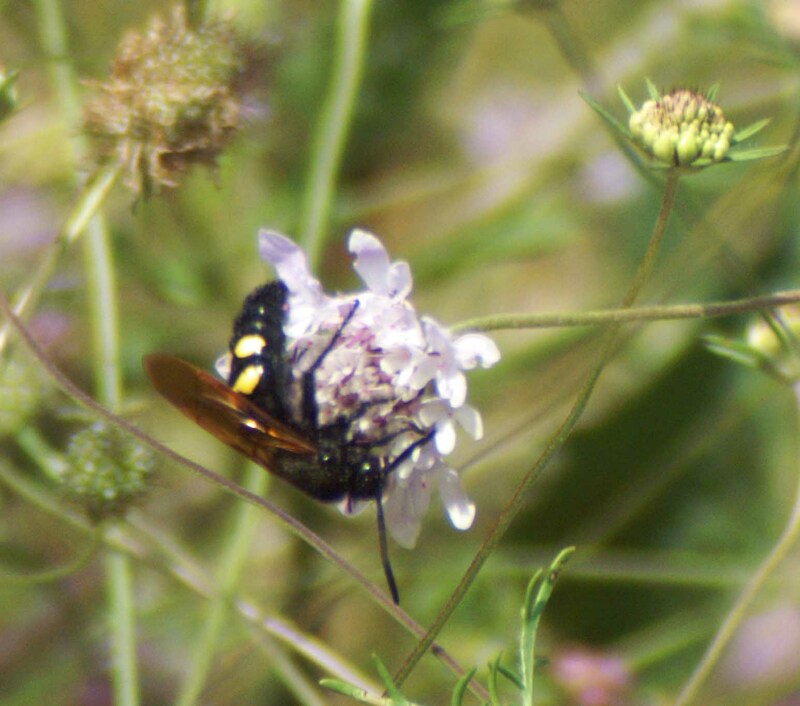 In previous years, bees and other insects would be crawling over each other on the flowers. This year – maybe one or two bees and a few other small insects and that was it. I could stand for 10 minutes watching between seeing bees. My own land is organic – about 3 hectares, with a large part of it being inaccessible due to dense, thorny undergrowth under the oak trees, so should be a good refuge for animals, birds and insects. The land around me is a mix of mainly olive groves and further pockets of holly oak. Unfortunately, to maintain the olives, the local campesinos still spray heavily – mainly with a glyphosate derived weedkiller – and this seems to be having devastating consequences. Hi, I’m just back from the south of France. I saw a lot of these wasps. They are solitary but I’ve seen more than ten species together on a few plants near the river! When I look back at my pictures these were only females. They were often attacked by smaller agressive wasps. 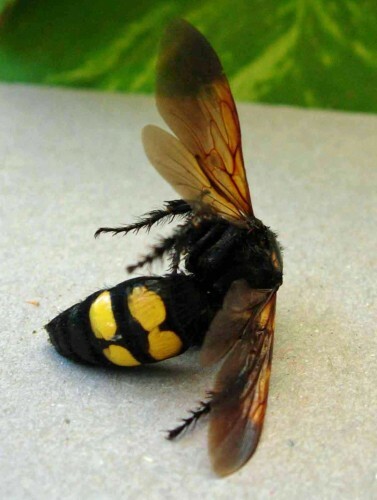 A few times a wasp falls suddenly to to the ground. They are not good climbers! And maybe a bit to heavy. The wings of most of the mammoth wasps were a little bit damaged at the edges.